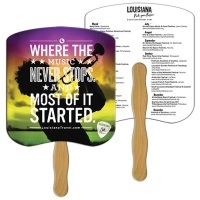 When you need to print more than one or two colors on a fan, consider our digitally printed Full Color Hand Fans. 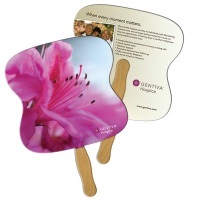 Put your logo in their hands, with a two sided, digitally printed in full color, high quality film laminated fan. Sticks are glued (not stapled) to fan back for safety and appearance. High density 22 pt. thickness. Print your custom message in multiple colors on one side or both sides! Wooden stick handle is exposed on back side of fan. Plastic handles are also available for an additional charge. Handles are glued, not stapled. Not sure which fan is best for your needs? Give us a call (706-374-0710) to discuss your needs. An additional $35.00 non-refundable artwork charge must be paid before work can begin. Production time is approximately 10 business days after proof approval. Camera-ready artwork is preferred for full color hand fans. Additional art charges apply for complex art. Photos or pictures, add $45.00. 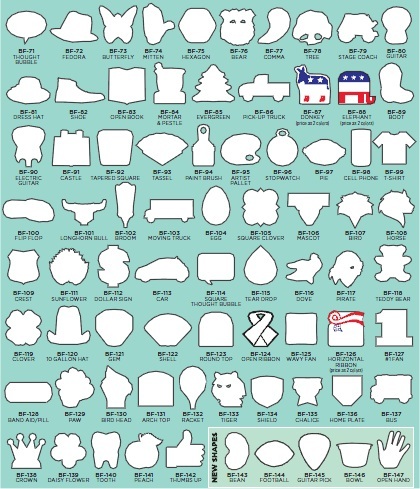 State fan shapes are available also for Arizona, Georgia, Illinois, Iowa, Louisiana, Maine, Michigan, Missouri, Nebraska, Nevada, Ohio, Pennsylvania, South Carolina and Texas. 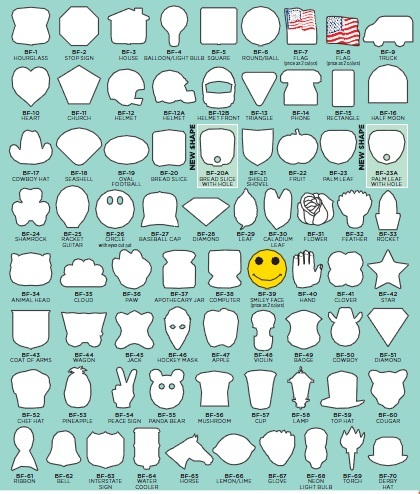 Custom fan shapes are also available (for an additional charge). Each hand fan is about 8″ x 9″, not counting the handle. Be sure to order early, especially during the hot summer “fan season”. Need less colors printed on your fans? 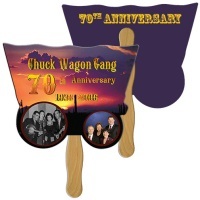 Be sure to see our Custom Printed Hand Held Fans.